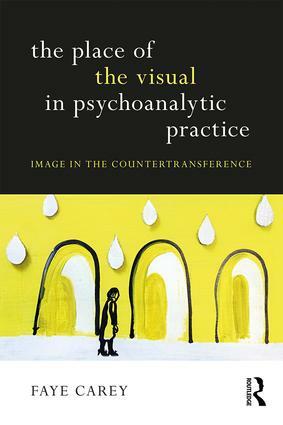 The Place of the Visual in Psychoanalytic Practice: Image in the Countertransference　explores the place of the visual image in psychoanalysis and psychotherapy, a still relatively unexplored topic in the psychoanalytic literature. Though ‘talking therapies’ are necessarily structured around the use of the spoken word, it can be difficult and at times misleading to explore the unconscious through speech alone. This book examines how it may be further understood through recognising the presence of imagery as a form of non-verbal, but valuable, means of communication. Drawing on the work of Freud, Bion, Winnicott and Ogden, alongside other British and American contributions to this infrequently addressed subject, the book examines the connection between reverie, dream and daydream and explores the reservoirs of imagery of both client and therapist, focusing mainly on the therapists' s visual countertransference. Covering essential theory and a wealth of clinical material,　The Place of the Visual in Psychoanalytic Practice: Image in the Countertransference　is a rich yet accessible guide to both recognising and using visual imagery within the clinical setting for both psychoanalysts and psychotherapists. "Faye Carey has written a book that is engaging, challenging, even inspiring. Her book is scholarly, as she traces the development of ideas about the use of imagery by both patient and analyst in the psychoanalytic literature, and also passionate, as she regards the devaluation of the visual within psychoanalytic theory and practice in favour of the verbal as having deprived analytic practitioners of a rich and potentially liberating source of material for making better sense of their patients’ internal world." "A bird, a spider, a laundrette, a busy junction: this fascinating, lucid book explores the occurrence of ‘oblique’, fugitive visual images in the analyst’s mind. With an impressive depth of theoretical understanding, Faye Carey systematically guides the reader through ideas about internal space, reverie and projective processes, representation and representability, images in relation to words, and the dynamic, collaborative nature of image construction: the unbidden image can be a crucible for unconscious processing. Drawing mainly on British and American sources, and enlivening her text with case material and with her own sketches, Carey has produced a work of satisfying richness." 1. WHAT IS A MENTAL IMAGE? Faye Carey is a psychoanalytic psychotherapist in private practice in London, UK, and Chair of Training for the London Centre for Psychotherapy.